I’m gonna go with … America. Outskirts or small old town enveloped by Pittsburgh. I thought I had a chance this week. Not to win, but at least, maybe, to get a location right and build up my credentials. I knew everyone would froth at the bit this week. So many clues! I started with the Sports Authority website and either cross referenced the location with Home Depot, or later, just started looking up the Sports Authority addresses on Google Maps. Do you know how often they are practically right next to each other like in your photo? Too many. Of course, none of those were the contest site. And FYI, other places that Sports Authority likes to cozy up next to are Best Buy and Target. In the end, I failed. I couldn’t find it. Not even with all those clues. I must have missed one. The right one. But I bet you get a lot of right answers this week. Just not mine. The Home Depot, Sports Authority, Exxon? Really? Seldom have I been less inspired to make even my standard random guess. I was convinced this was in eastern Canada – an Esso gas station, deciduous trees, a one-way sign (so not Quebec). But a few searches convinced me Home Depots in Canada are built in sprawling power centres with no trees anywhere. And maybe that is an Exxon sign. I’m pretty sure it’s somewhere in the New England, an industrial-ish town, near a canal, in a place long-enough established to have an old stone church. Massachusetts. It’s a beautiful day here in Montreal. I’m going for a walk. Fortunately this looked like the Northeast U.S. and that narrowed it down pretty quick. A Google Maps search finally revealed this view to be in Waterbury, CT – specifically the Courtyard Waterbury Downtown – Marriott located off I-84. This looked like a scene from the northeastern United States, so I checked out Sports Authority stores in Pennsylvania, New Hampshire, New York, then Virginia and North Carolina. Somehow, I skipped Connecticut and I then went through a tour of Sports Authority stores in virtually all the states, including California, Texas, and far-flung Alaska and Hawaii. When I finally decided to check Connecticut, my mind was in such a blur that I failed to properly recognize the location when it showed up. What about the tower in the distance? I searched for “water towers” – that didn’t help. The next day, I decided to stick to the Northeast, and search for built-up cities with hilly profiles, which finally brought me to Waterbury, CT. I checked for Home Depot and it looked exactly like the one in the photo, with the Garden Center on the right and across the parking lot was the Sports Authority. When I noticed that there was even an Exxon nearby, I started to believe that I was in the right place. 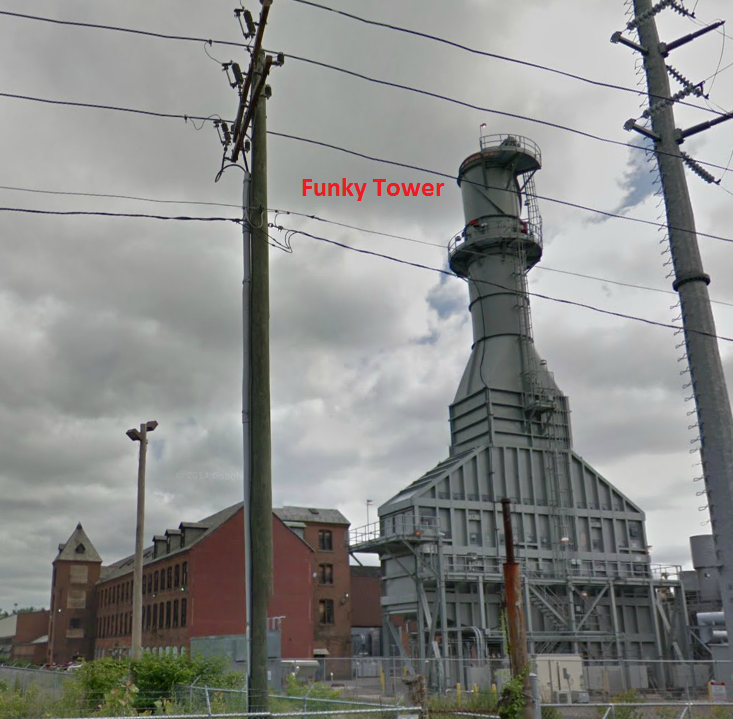 The funky tower turned out to be part of a power plant: Waterbury Generation. 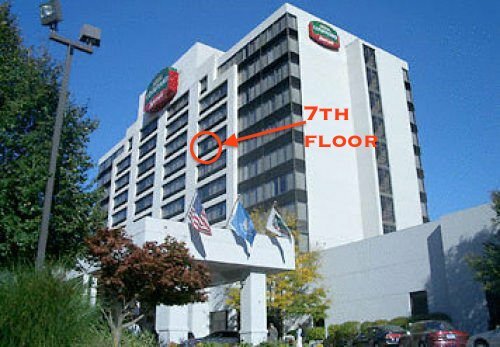 It was then easy enough to locate the location from which the photo was taken – Courtyard Waterbury Downtown Marriott – I believe it’s the 6th floor in the window indicated in the image (note: the bottom floor is hidden in the image). I got this one on a gut feeling. I grew up in Connecticut, and the general vibe instantly said New England. I am also a child of the big box era and remember when people looked in awe at Home Depot, Sport’s Authority and the like; these are clearly aged. As a teenager, I also drove around the state constantly assisting my father, who through much of that time was a self-employed commercial real estate appraiser. The topography, highways, and industrial and cultural markers of the city suggested something like Waterbury. The Sports Authority gable, it turns out, is relatively distinct for its kind. With Google street view I almost was able to go into the back parking lot of the bank. The landscape and the depressing green paint on the highway bridges instantly spoke to this Connecticut native and I knew that we were looking at the perpetually depressed Naugatuck River valley. A few readers could barely make out a Connecticut license plate as well. For goodness’ sake, do you have any idea how many Sports Authority shops are located near Home Depots in the United States? I didn’t until now. I think it probably says something about the homogenization of American commerce to find so many big-box retailers in proximity to each other in so many places. 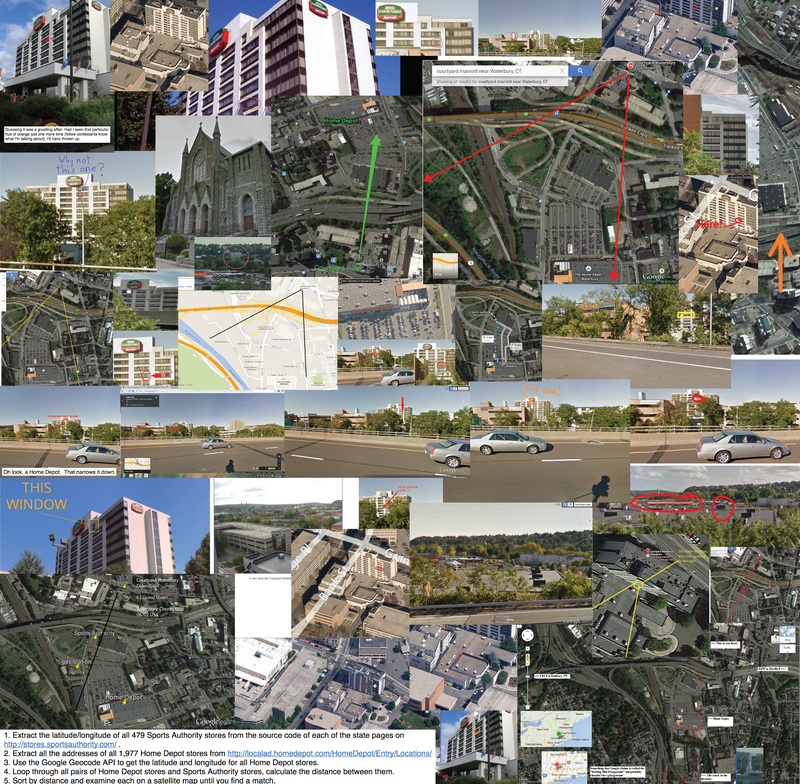 My method for this contest, after identifying the aforementioned superstores in the photo, was to use their own website store locators to narrow the list of states where they do business. It turns out that Sports Authority does business in 45 states, so I only eliminated 10% of states. The terrain is green and hilly, though, so that ruled out most of the dry western and flat plains states, and based on the architecture, I decided to focus on the northeastern United States. I worked through New Jersey, Pennsylvania, New Hampshire and Massachusetts before I found Waterbury, Connecticut. 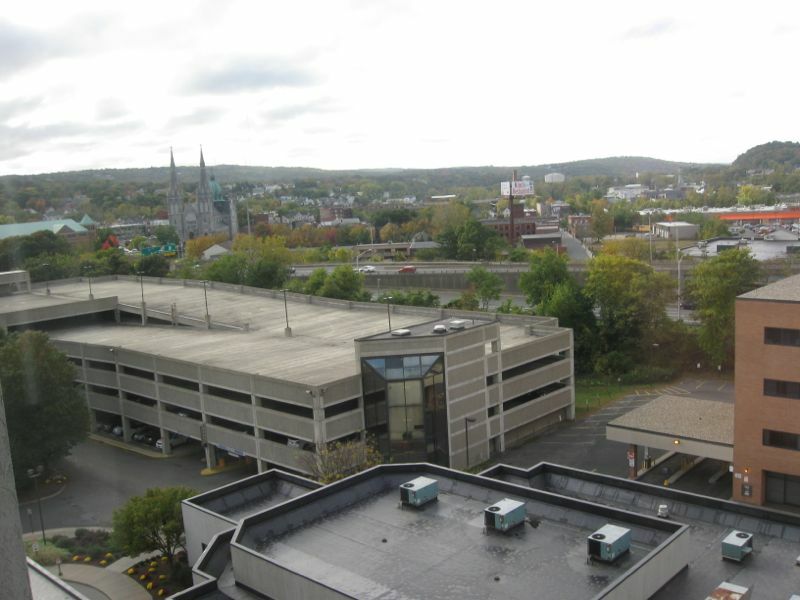 This view was taken from the Courtyard Waterbury Downtown at 63 Grand Street, looking south across Interstate 84 (Yankee Expressway) toward the shopping center. Do you know how many of the 420 US Sports Authority stores share a common street with a Home Depot? I never did. Do now. 80. Fortunately this one was in Connecticut, not Wyoming. I might still be working at it. 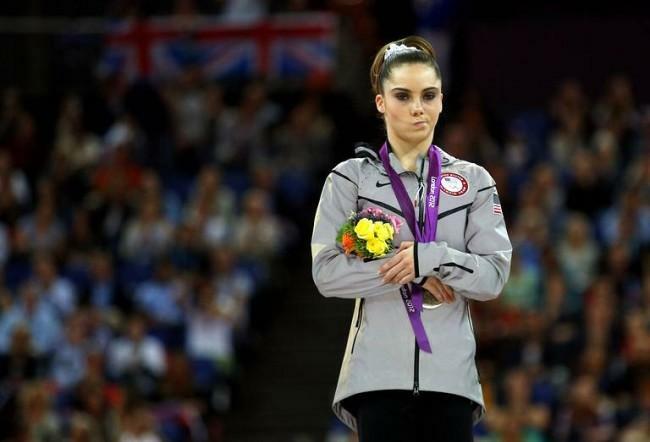 I’ve spent almost 2 hours looking at The Sports Authority’s website looking for the right building. (By the way, the photo of Bemidji, Minnesota’s store is taken in the snow, which amuses me.) I’m sure the webmaster is shocked by the increase in web traffic today on their locations site as I’m probably not the only one doing this. We did this the ridiculous way: my brother and my fiance, both programmers, wrote scripts to take all the locations of Home Depots and Sports Authorities in the US, convert them to GPS coordinates, and spit out a list of all the ones that were close together. Then I got really good at evaluating Home Depots on Google satellite images until, finally, we got to this one, which had all the right elements: a Home Depot with three pointy greenhouses and four round ones, a Sports Authority across the way (with 0.34km between them, if you’re wondering), an Exxon off to the side, and a bank with a drive-through across the highway. And, bonus, a hotel behind the bank with just the right line of sight! Never been there but lived in Connecticut as a child (1965 – 1970) and recognized the state right away. I guess you just imprint on the place where you grew up and even 40 years later it’s just instant recognition, like an ancestral memory. A lovely tree-filled hillside is punctuated with big box stores and a two-tiered highway. The bland office building in the foreground houses an insurance company. All that’s missing is a McDonald’s and a Starbucks. We have visited with my in-laws. I love visiting any museum and this one combines the clock and Timex history in Waterbury with an exhibit about Easter Island and Thor Heyerdahl’s expeditions. It seems Heyerdahl was friends with the Timex owners and the Kon-Tiki expedition was partly funded by them. In 2004, the Hartford Courant ran an interesting story about the “Radium Girls” of Timex. These young girls were paid for each piece produced; they painted the dial faces for the glow-in-the-dark wristwatches. Many died of radium poisoning as the girls “were told they could paint faster if they dipped their brushes into the radium-laden paint and sharpened the bristles with their lips.” This was known as lip pointing. Being good at your job was deadly. 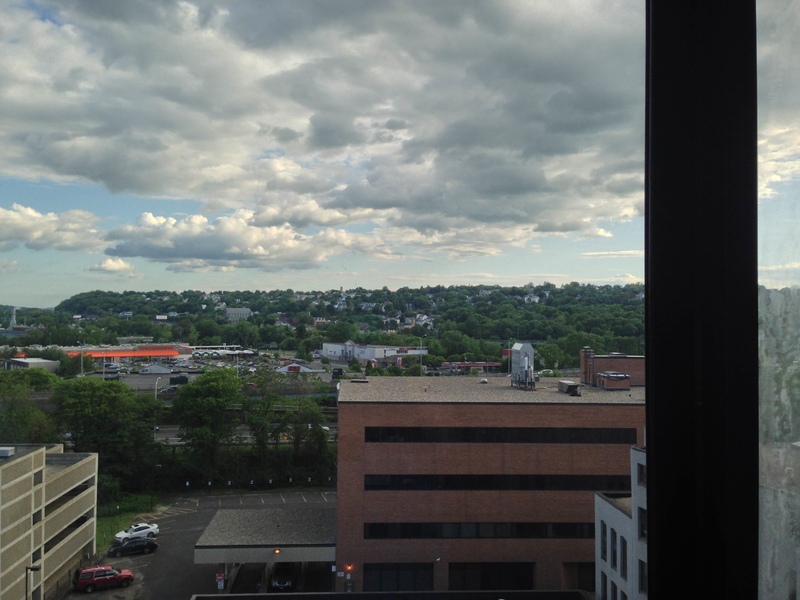 This week’s view was taken from a room in the back of the Courtyard Marriott at 63 Grand St, Waterbury, CT, overlooking I-84 and the desolate hellscape that is central Connecticut. Please pardon my crankiness … it’s just that I think I may have nightmares for months about the finishing details of Home Depot and the graphic design of the Sports Authority logo. I’ve attached a picture with my best guess at the window circled. I’m not sure what the room numbering system is, so I’ll just guess 815. Waterbury looks like a nice place with a wonderful history of political corruption, including being the old stomping grounds for both a convicted lieutenant governor and a convicted governor. The former was T. Frank Hayes who, according to the New York Times, in the 1930s “invested some of his kickbacks in a company called the Electric Steam Sterilizer Company [and] had a bill introduced requiring the installation of electric steam sterilizers in all of Connecticut’s public toilets… Coincidentally, the only electric steam sterilizers were manufactured by Electric Steam Sterilizer.” John G. Rowland was the convicted governor, who upon his release from federal prison became Waterbury’s allegedly “no show” economic development coordinator before leaving to host a talk radio show. 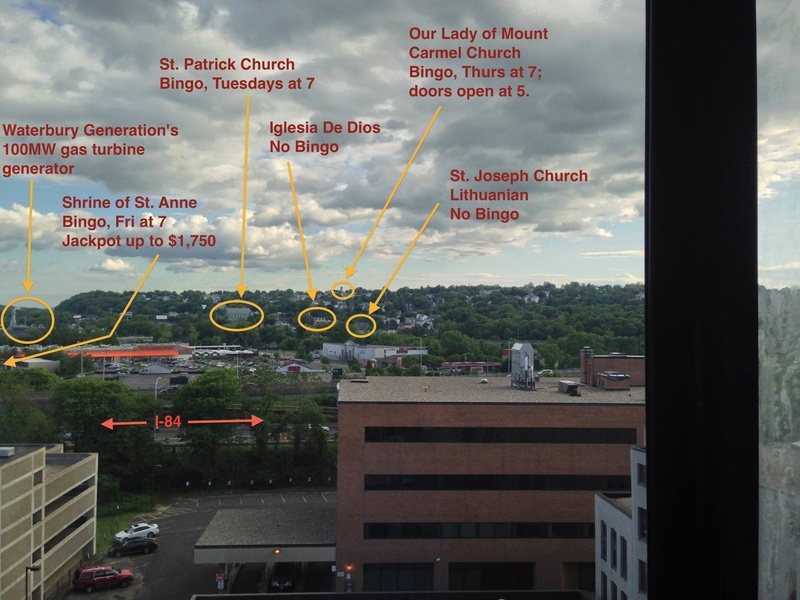 Above is the contest photo with some of the sights identified, including information on which churches host bingo nights in the vicinity. I know. Critical information. For some reason my wife thought I might have better things to do with my time than research area bingo options. Given the alternative was weeding in the garden, I thought otherwise. 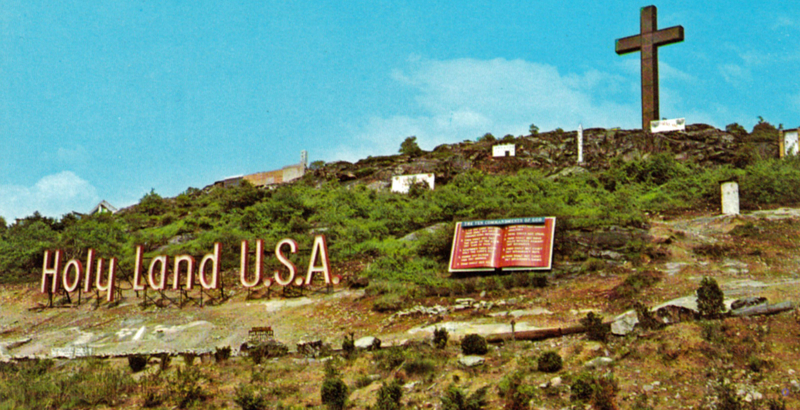 Did you know that Waterbury, Connecticut is the “brass capitol” of the world? Well, it is and … dear lord, even the Wikipedia factoids are putting me to sleep with this one. This week’s pic was taken from roughly the eighth story of the Courtyard by Marriott and looks south by southwest along a heading of 212.23 degrees. I would guess about the ninth floor! I was in Connecticut at the end of May for the wedding of my partner’s cousin. The bride is Portuguese and Italian American and the groom is of Irish descent; all three immigrant groups have a sizable presence in Waterbury. As for the photo itself, it was taken from Room 915 of the Courtyard Marriott. 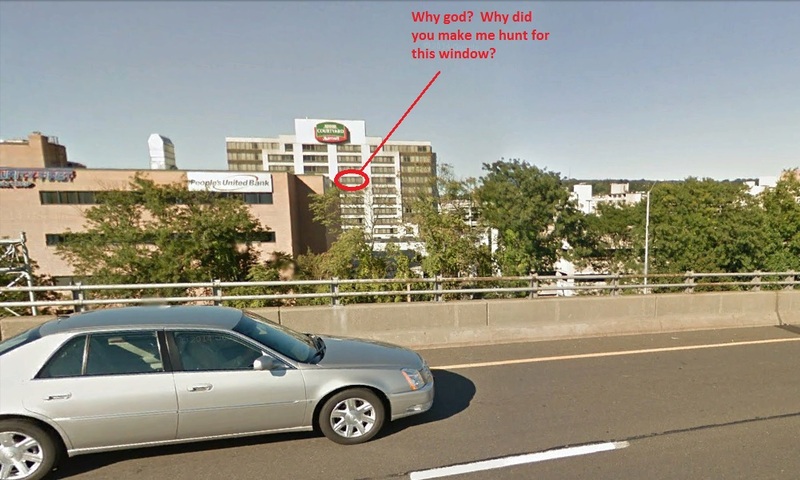 If you search for “Waterbury Courtyard Marriott view” in Google Images, actually, you’ll find a very similar picture taken by someone else in the ninth row of results. I’m guessing that the triple combo of Home Depot, Sports Authority and the gas station is going to be the giveaway clue and there’ll be a swarm of correct identifications. Looking forward to seeing all the funny, impressive and obsessive answers that Dishheads will come up with! The Dish has posted a few of my submissions as VFYWs in the past two years (which is about how long I’ve been a regular reader), but this is my first time being picked for the contest, so this is quite an honor. My next goal is to actually *win* the book–though I’m still a very long way off, thanks to those aforementioned funny, impressive and obsessive Dishheads.